TRUCK SIDE LADDER RACK, ladder racks mount to the side of the truck box. box, thus maximizing ladder stowage capacity. Universal Ladder Rack Section for this method. 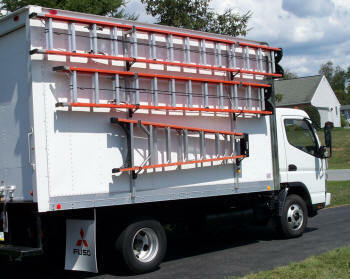 Box Truck Body Ladder Rack, Style 9. VertiRackTM box truck, side mount, vertical ladder racks, mount to the side of the truck box, rather than the top of the truck box. Stowing ladders on a side mount ladder rack is a much easier and safer operation than ever before. Side mount ladder racks keep personnel off of the truck box roof. 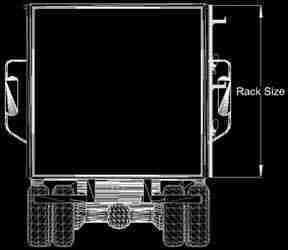 The box truck, side mount ladder rack has been an idea contractors have had for many years, spending countless hours mounting ladder hooks to the side of their truck box, or welding tubing together to come up with something that in the end, was less than ideal and only marginally secure. VertiRackTM box truck, side mount, vertical ladder racks offer the user the utmost versatility, adjustability and security available in a side mount ladder rack. VertiRackTM box truck, side mount ladder racks feature infinitely adjustable ladder rack mounting points, infinitely adjustable ladder support arms, and include, infinitely adjustable ladder securing straps. What does all this mean to the contractor? It means that mounting the ladder rack to the side of your truck is easy, because the mounting points can be located anywhere along the vertical rails length. The ladder support arms and the ladder securing straps can be easily positioned anywhere on the ladder rack itself. The ladder support arm and the ladder securing strap adjustability, allows you to space the ladders out over the surface of the ladder rack, for ultimate convenience; or close together for maximum capacity. It also allows the hanging of step ladders with the ladder bases located alternately to fit more ladders in less space. In essence what all this adjustability adds up too, is that you mount the ladder racks vertical rails to the side of your truck box; then decide exactly where placing your ladders on the rack would best suit you. VertiRackTM box truck, side mount ladder racks are made of high strength, anodized aluminum and stainless steel for optimum performance and longevity. The ladder support arms are fully rubber treaded, and along with the transportation grade rubber ladder securing straps, keep the ladders isolated from ladder rack contact; thus eliminating ladder wear. theft is your padlock. The ladder lock assembly attaches to the ladder rack to prevent theft or loss. VertiRackTM side mount ladder racks feature 100% componentized construction meaning all parts are replaceable. Should you have an accident, or choose to add an extra ladder to your ladder rack, parts are always available. VertiRackTM sets the standard in side mount ladder rack construction. VertiRackTM Box Truck Ladder Racks, mount to the side of the truck box.